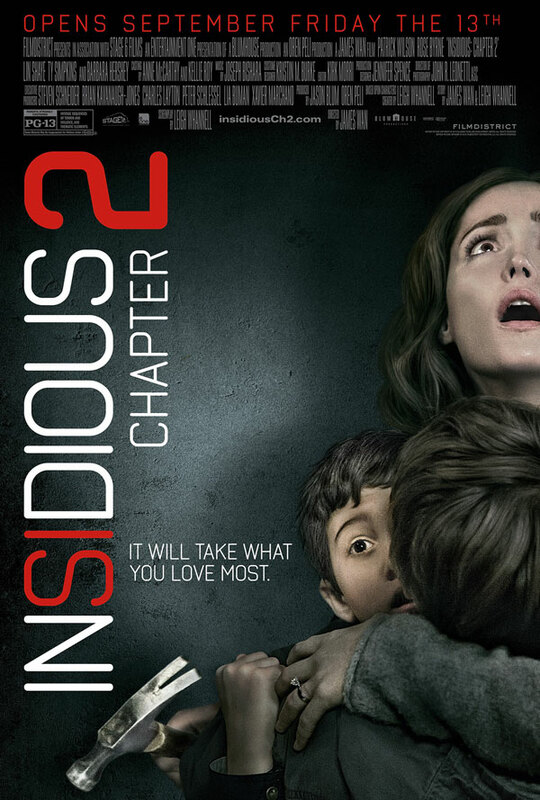 The first Insidious was a sleeper hit back in 2011. Many people praised its more laid back approach to horror, while others disregarded it as an excuse for jump scares. When I initially saw it at the drive-in (still the best way to see a horror movie outside of a grindhouse screening!) it was on a double bill with Scream 4. I went in expecting that Insidious would be the vastly superior film and Scream 4 would be subpar. Imagine my surprise when I found Insidious to be an overly long boring mediocre film, and Scream 4 turned out to be the best entry in that series since the original. But this is not a review of either of those films, but the sequel. I’ve done my best to go into the second installment in the budding franchise (it already appears Insidious Chapter 3 has entered pre-production) with a clean slate. The boring taste that the first film left in my mouth was mostly washed away by 2012’s The Conjuring, from the same team. While not a classic by any means, it seemed to take everything that was wrong with the first Insidious and fixed and improved upon it. As well, many rumblings amongst the horror community were much more divided on the sequel, so I was indeed looking forward to it. The film begins with a flashback sequence to Josh (Patrick Wilson as an adult, Garrett Ryan as a child in the flashback) and his first experience with the paranormal and help from a young Elise (Lindsay Seim in the flashback, the always awesome Lin Shaye in the current day). From there, the film picks up literally from the ridiculous ending of the original film, and moving on from there. Elise is now suspiciously dead, and Josh appears to be the main suspect despite not knowing of anything that has happened. After a brief interrogation scene with Josh’s wife Renai (Rose Byrne) we see the family staying at the house of Josh’s mother Lorraine (Barbara Hershey in the current day, Jocelin Donahue in flashbacks). One thing I can say for the film is the casting is fantastic, and everyone puts in a valiant effort. The film bounces back and forth between the current day and the past. In the current day Josh and Renai are mostly tied to the house, while Lorraine has enlisted the help of Specs (Leigh Whannell) and Tucker (Angus Sampson) from the original film, as well as Carl (Steve Coulter) who was present for the initial issues with Josh. As Lorraine and “the team” investigate an old abandoned hospital (cliché alert!) we get flashbacks to when Lorraine worked at the hospital when she was younger, and how it all ties in to their current ghost and possession problem. To say the film is flawed would be an understatement, but there is good to be found. As I previously mentioned, the cast is top notch and gives it their all. The problem therein lies in the fact that they are hampered down by a cliché-ridden script. Just once in a horror movie I would like to see an abandoned hospital that isn’t littered with creepy baby dolls ad old styled strollers. It’s not that I am against clichés in my horror movies, hell, I watch and love almost every Friday The 13th movie. But sometimes there needs to be a limit on how many you can cram into a 2 hour movie. When you are getting hit with one every 5 minutes it becomes so incredibly noticeable that it begins to take away from the movie, and as such how much one can enjoy it. I mean, if you aren’t well acquainted with horror, I suppose there is much here to like, but any hardened genrephile is going to spend a good chunk of the film rolling their eyes and trying not to laugh. And that is to say nothing of the lapses in space-time continuum. Again, I have to praise the cast as they do the best with what they are given. Especially ironic is how enjoyable the character of Specs is, seeing as he wrote the script. But maybe he is just happy to be in front of the camera. Patrick Wilson also does a superb job with much of the script being reliant upon his performance, and he definitely gives it his all. Barbara Hershey and Rose Byrne are also fantastic as per their usual. It’s almost frustrating seeing this good of a cast squandered, but perhaps one day they will find a great movie to submit their performances to. As for the directing, it seemed like all the steps that James Wan took forward with last year’s The Conjuring he stepped back with this sequel. He does a rather good job building suspense in many scenes, but just as the suspense is about to hit its boiling point, it is usually undermined by a musical sting or jump scare. I am not sure if this is entirely the fault of Wan, but regardless it hurts the film. Overall, I think the films biggest problem is it doesn’t bother to create its own identity. What starts out as a Poltergeist knock off merges into a weird cross between The Amityville Horror and The Shining, with a little bit of Norman Bates from Psycho syndrome thrown in just to mess it all up. If it had been a cash-in sequel made by different people it’d be a little more understandable and become more forgivable, but it was the exact same team for the most part. The only thing one can fully assume is that they bothered putting all their effort into the vastly superior (but still flawed) Conjuring. In the end, it’s hard to believe that it was as successful as it was, but I guess the movie going public just doesn’t know good horror. Insidious Chapter 2 just can’t form its own identity and suffers strongly from what seems like too many ideas thrown into a blender and never fully mixed.